The business of private service is a unique one: our employer is purchasing a carefree life. It is a big responsibility. Every day, we put their priorities before our own. It’s essential to enjoy serving, no matter what our job level is. It shows when we like what we do, and it makes a difference. Service is all about details. Dedication is more important than anything else. Our work is about perfection, we do our best every day, and we try to do even better the next day. That is why we constantly perfect our area of service and improve our skills, no matter what they are. For example, a laundress will make sure that clothes are perfectly cleaned and folded every day. We can never lower the quality of service. As an estate manager, I regularly revise the standard operating procedures (SOPs) with my team to help everyone ensure consistency in the quality of their work. Some of the most important skills can’t be learned, but formal training is also important, of course. Dedication and training make a perfect score. You must also be a good team player. Without team work, there is nothing. We are our best as part of a team. We must be discreet and flexible. Each employer, each member of a household is different. To serve them well and offer the personalized service that they expect, we need to understand their needs and adapt. Finally, it’s important to remember that there is a line not to be crossed. The employer is buying our services, they are not our friends. A good professional relationship is precious. Besides dedication, team work, and love of perfection and cleanliness, what skills or attitudes help you succeed in private service? Please tell us in the comments below. 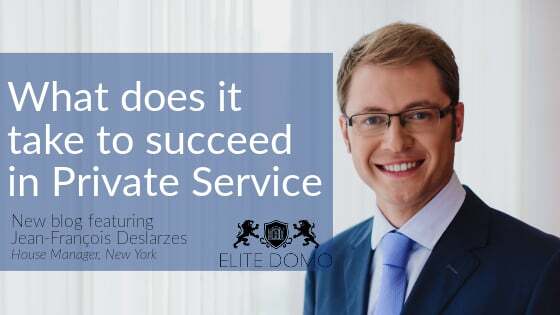 Jean-François Deslarzes is an Estate Manager in New York City. He has been working in private service for 30 years and is still as passionate as on his first day.